Let’s face it. If there was such a thing as a popularity contest for vegetables, the humble cabbage probably wouldn’t have much of a chance. Not when there’s much sexier vegetables like asparagus, Brussels sprouts, and ramps out there. 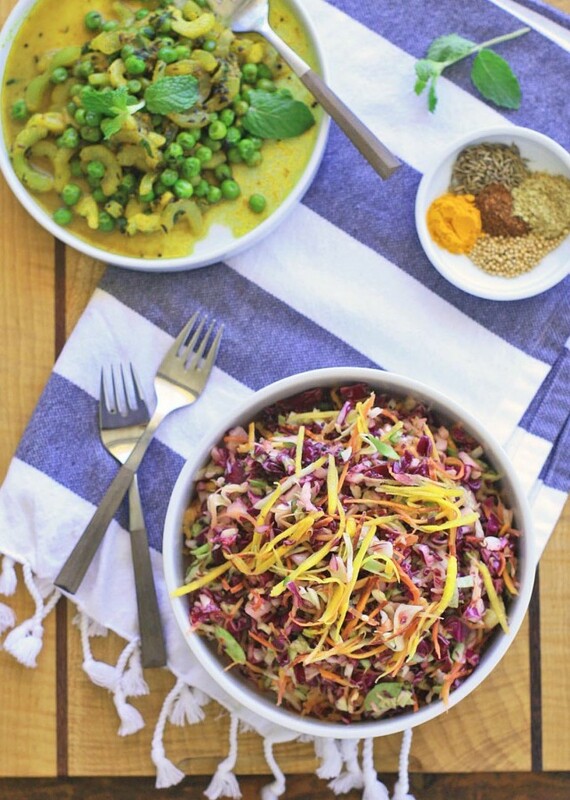 But while I could probably live without some of those other veggies, life without cabbage seems almost unthinkable. No Korean kimchi? No Polish kapusta? No Italian peasant soup? No spicy Indian cabbage? Some of my very favorite dishes are made primarily from cabbage. And with each new cuisine I cook, it seems like my love affair with the hardy, leafy vegetable deepens. Cabbage may be considered peasant food in many countries, but I’ll take peasant food over molecular gastronomy any day. 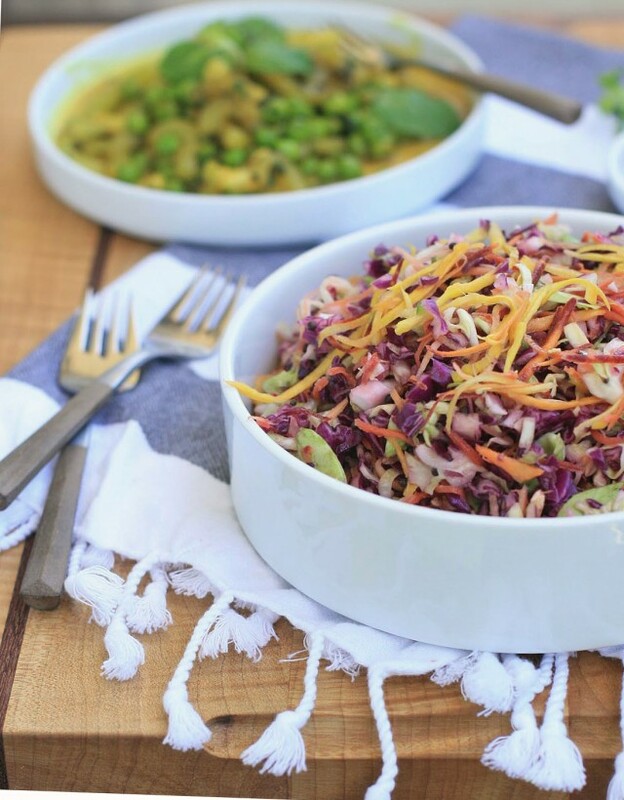 In this colorful salad, which is another one of my favorite Indian recipes, red and green shredded cabbage are combined with grated carrots and tossed in a lemon juice dressing that’s spiked with hot Serrano chiles and pungent mustard seeds. Bright tasting with plenty of crunch, it’s a great side to rich, coconut milk-based curries. 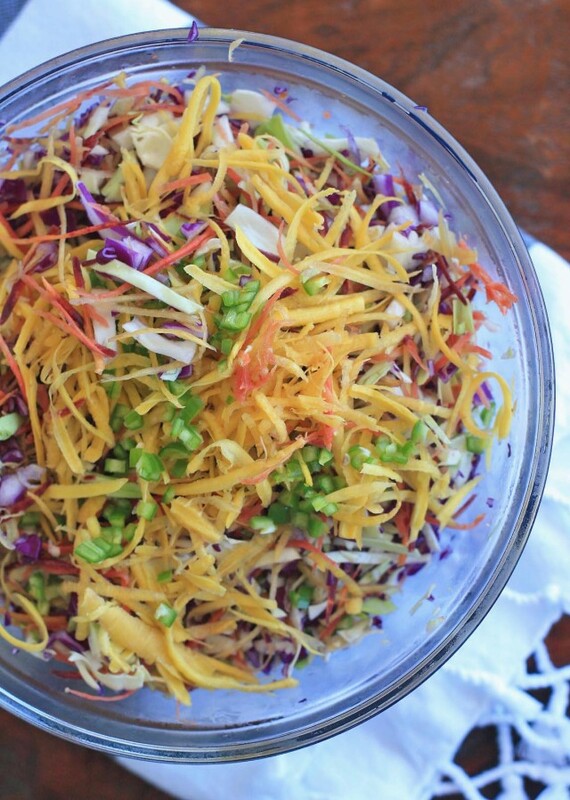 I like to make this colorful salad with red and green cabbage as well as purple, orange and yellow carrots, but it’s still excellent with standard green cabbage and orange carrots. 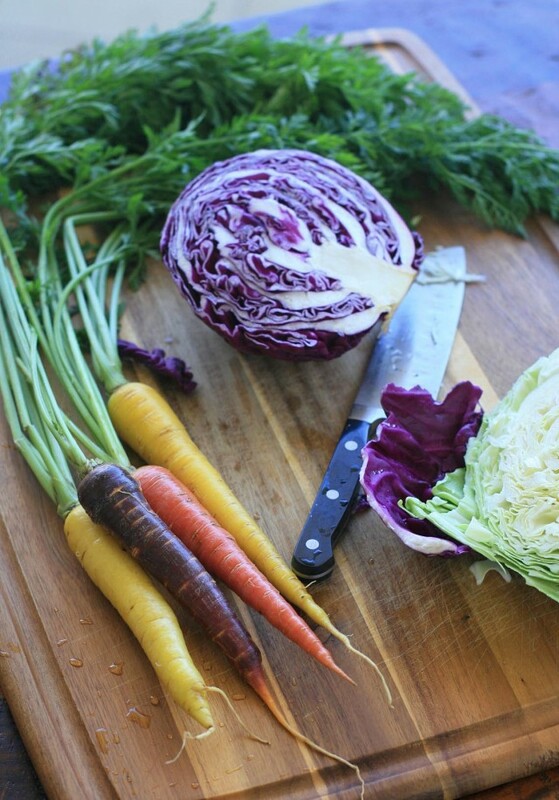 In a large bowl combine the cabbage, carrots, Serrano, lemon juice, salt and sugar and toss to mix. In a small saucepan heat the oil over high heat. When the oil begins to smoke, add the mustard seeds and immediately cover with a lid or splatter screen. When the seeds have stopped popping, immediately remove the saucepan from the heat and pour the oil and seeds over the cabbage mixture. Toss to coat and serve immediately.